North American hedge funds (NAHFs) have been among the best performing hedge fund managers over the past two years; since the meltdown of the US subprime mortgage markets and spillover of resultant credit crises into other asset classes. The Eurekahedge North American Hedge Fund Index has returned a healthy 5.2%1 over the two years since June 2007, while the S&P 500 was down 38.8% over the period. The region’s hedge fund industry, which makes up almost seven-tenths of the global hedge fund industry, shrank significantly through 2008, partly due to the collapse of some large centuries-old financial institutions, triggering a marked rise in risk aversion and widespread withdrawals from hedge funds and most other investment vehicles during the year. The region’s hedge fund space currently comprises close to 4,600 hedge funds, managing US$870 billion in assets. Despite the shrinkage witnessed through 2H2008 and early 2009, this marks a 30% increase in the fund population and a 50% increase in assets since December 2003 (refer to figure 1). A notably larger percentage increase in assets than in the number of funds (despite the fact that assets shrank 18% in 2008 while the number of funds fell by a palatable 2.3%) suggests that the industry has seen significant inflow of capital from investors across the board over the past few years before 2008. This is partly owing to the consistent performance delivered by managers in the region, many of whom were able to lure investors with an excellent track record of returns and decades of experience in the business. 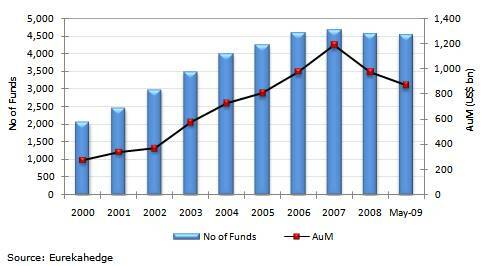 1 Based on 65% of the funds reporting their June 2009 returns as at 17 July 2009.